The A-Side is one of my favorite songs ever. It is amazing. The percussion seems like it is outrunning itself but somehow comes together beautifully with the synthwork. It is perfectly capped at ten minutes, just enough to let you lean back on a busride or in your living room and reflect upon how we were lucky enough to witness myriads of possible universes culminate in this, ours, and this track emerging on the other side. Barnstorming, cracking, brilliant piece of work. 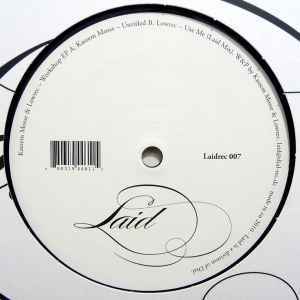 Is it just me or do Laid EP's always go for a ridiculous price? Desperately want a repress however, these tunes are not one to miss! One of those rare 12"s where both sides are just fantastic. Both tracks will take you on a journey, mesmerizing, wonderful and warm.